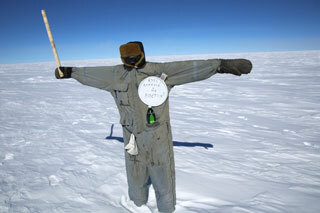 Diary of expedition "Antarctica. 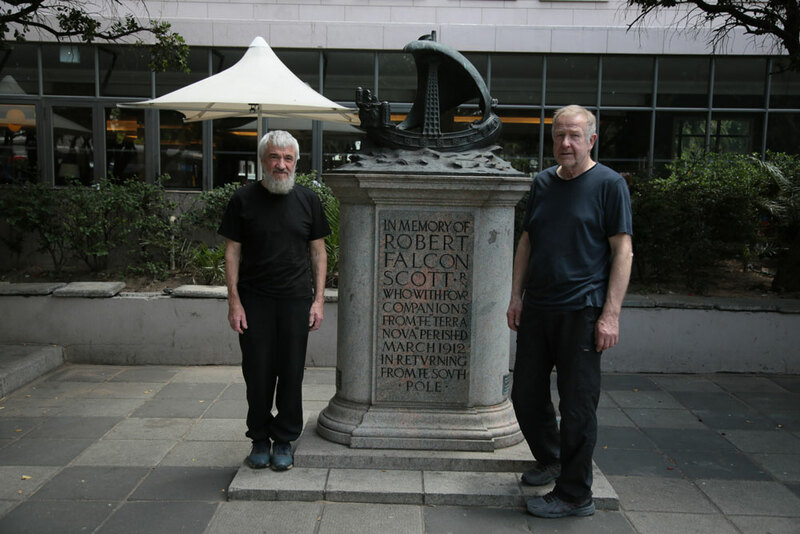 200 years of discovery"
January 18, 2019, S 69°23', E 11°49'. The Schirmacher Oasis. 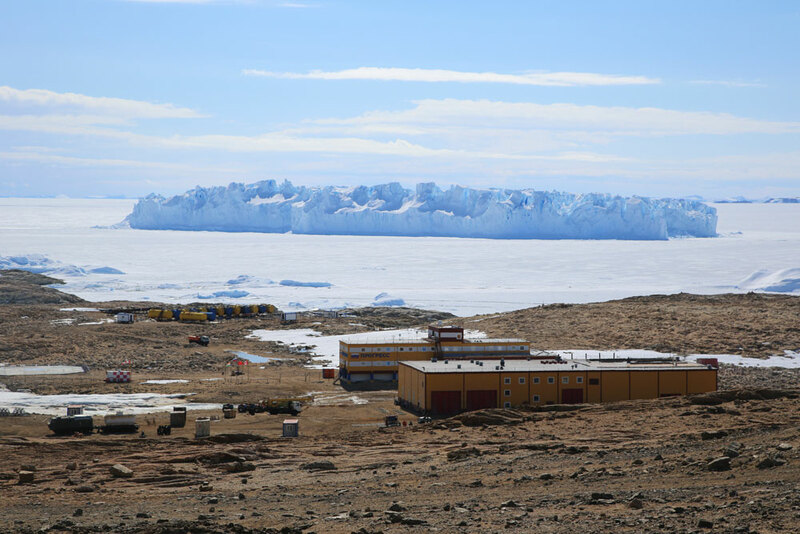 Novolazarevskaya station, old territory, which is used (or owned) by ALCI, the South African company, as a hotel for transshipment of tourists and workers of various polar stations arriving to Antarctica via NOVO airfield. For the third day we are hanging around the neighborhood, nothing to do, I am writing the diary. 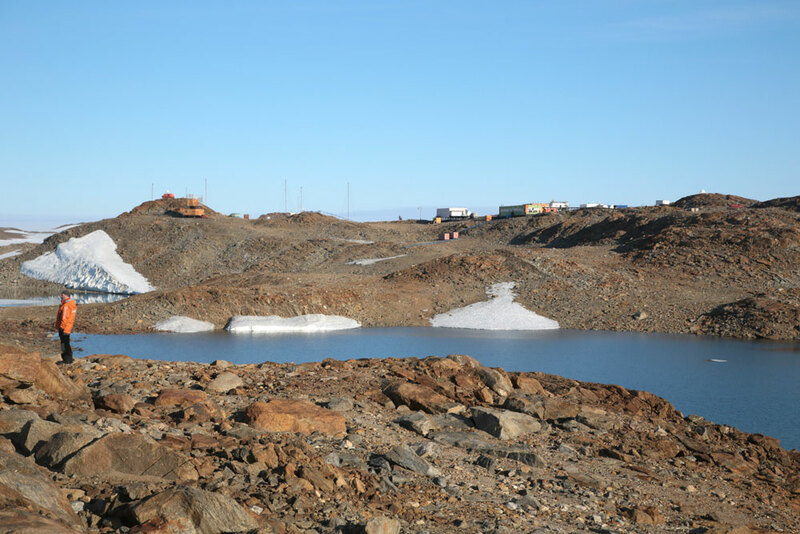 We talked with the drivers of the Toyotas from the Arctic Trucks company who delivered fuel to the 83rd degree, there is an annually organized fuel subbase there for both airplanes and motor vehicles. 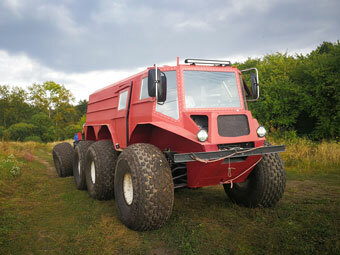 According to their words, a Toyota ATV with one trailer consumes up to 80l/100km on difficult terrain. 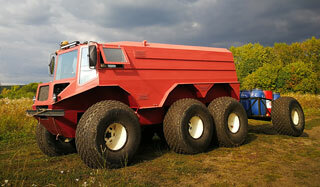 Prices for these good-looking vehicles match their appearance, 4x4 – $250 000, 6x6 – $300 000. Sometimes they break, even the astronomical price cannot protect from failures. Tonight Pelsh flew away from us, and we became orphans. Out of despair, we went for a walk in the direction of the Indian station Maitri. It takes an hour and a half to get there, the route, by local standards, is picturesque and unsafe at the same time. A couple of skuas arranged a nest right on the path, apparently, not finding a better place. 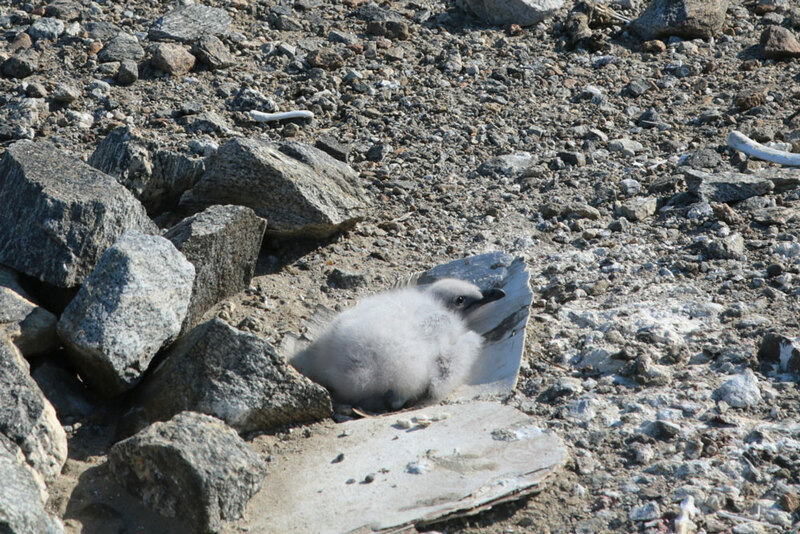 A piece of plywood on which the fluffy child was lying could be considered as a nest only by the owner of rich imagination, but it did not stop the parents from protecting it with all the strength of parental feelings. Having taken a few photos of their attacks on Nikolaich and of the nestling, we retreated, retaining the combat formation as far as possible. The Indians welcomed us good-naturedly, in a couple of minutes the chief appeared and invited us to his office to drink Indian tea. He is 29 years old, finished the winter term, will depart for home soon. Average age of the employees at the station – 35 years. The station was built in 1989, and it is visible; soon they are going to refurbish it. By supper time we returned to the hotel, where we were informed that the ALCI boss is arriving, and we are strongly recommended to get out. There is enough free space, but Mr. Kalyazin’s high social status does not allow him to stay in one house with us. Our compatriot, no wonder. Even living abroad for a long time has not changed the national code. 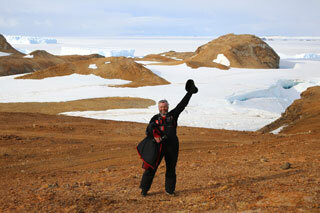 On this high-minded note our stay on the icy continent comes to an end. January 13, 2019, “Progress” station. Tomorrow is St Basil's Day. My name-day, and I congratulate myself with what! On the 12th, we loaded the vehicles on board the vessel "Academician Fedorov" by helicopter. I arrived on the vessel by helicopter, Obikhod and Makarov hooked the vehicles to the helicopter on "Progress". From the board of the vessel it was clearly seen that ice thickness in the bay where the vessel was anchored was sufficient to allow easily, without any risk, drive the vehicles up to the vessel within the reach of its onboard loading cranes, avoiding the helicopter. Five helicopter flights, an hour and a half, if not more, of helicopter operation is worth some money, and judging by indirect signs, not a small amount. In my opinion, the main reason was the desire to get rid of us with minimal risks, because we are associated with television, and the farther away it is, the less worries. The vehicles were loaded into the hold, I showed where the straps may be hooked, and in the evening the helicopter took us back to the station. I caught cold on the vessel because the clothing was thin, while the wind was fresh; I visited the doctor who gave some pills, now I am eating them and recover. Tomorrow we shall depart to Novolazarevskaya by a not old, just under 80 years, Douglas (DC-3) with new engines. The flight will last 7 hours without refueling, they say that’s because the pilot is very experienced, other pilots on the same airplane indispensably make an intermediate landing-refueling. The airplane belongs to the Canadian company Kenn Borek specializing in servicing of high latitudes in both hemispheres. Once upon a time there were many such airplanes in the Soviet Union, they were called LI-2 and flew all over the North. Then the clever big bosses (they are always clever, by definition) announced the onset of the era of jet aviation, and all these LI-2, IL-14, AN-2 and other airplanes were cut and passed to scrap, while the Canadians did not get that bright idea; they replaced the engines, equipped the airplanes with modern electronics, and old-timers fly where modern aircraft with their high takeoff and landing speeds are not suitable. All chassis fit them: wheels, skis, pontoons or tundra wheels. That’s how once again we managed to deceive the whole world and even ourselves. 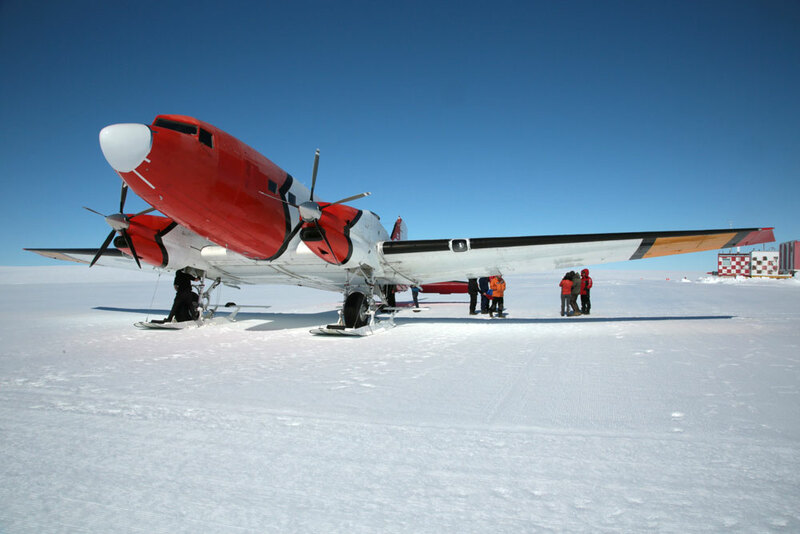 RAE (Russian Antarctic Expedition) has no airplanes of their own, they pay for each flight separately, unlike the Chinese or Germans who have bought such a workhorse for own use. January 10, 2019, “Progress” station. The actors and performers are the same. What happened during these few days of our stay on “Progress”? The main thing: at last the mechanics had a good sleep. On the 7th of January the weather was good and clear, while the forecast for the following few days was bad, so on the day of Orthodox Christmas, leaving aside all affairs, we went for a walk around the neighborhood, accompanied by doctor Igor and the ex-chief of Vostok station who has finished his winter term and was waiting for transport to home, to St. Petersburg. We visited a lake, bathed, photographed. 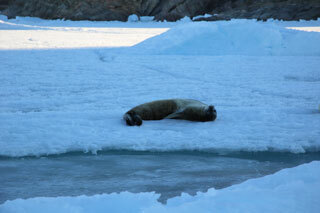 In the evening we went to the coast, on the ice, came close to a family of seals. The parents paid no attention to us, the kids stared at us curiously. The station is large, new, everything is good, especially at the power station, DES (diesel power station) as they call it here. 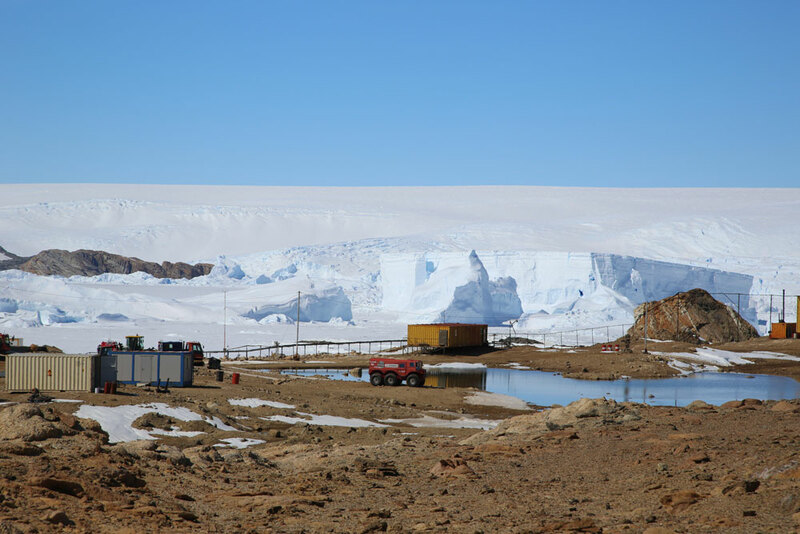 The multi-circuit heat takeoff system from diesel engines using it for heating of the premises makes “Progress” more efficient than most of our stations in Antarctica. We quickly repaired the all-wheel drive on the red vehicle, cleaned both ATVs, prepared the trailers for transporting them to the sea vessel by helicopter, and placed all oversized loads, for example, trailer drawbars, inside the vehicles. 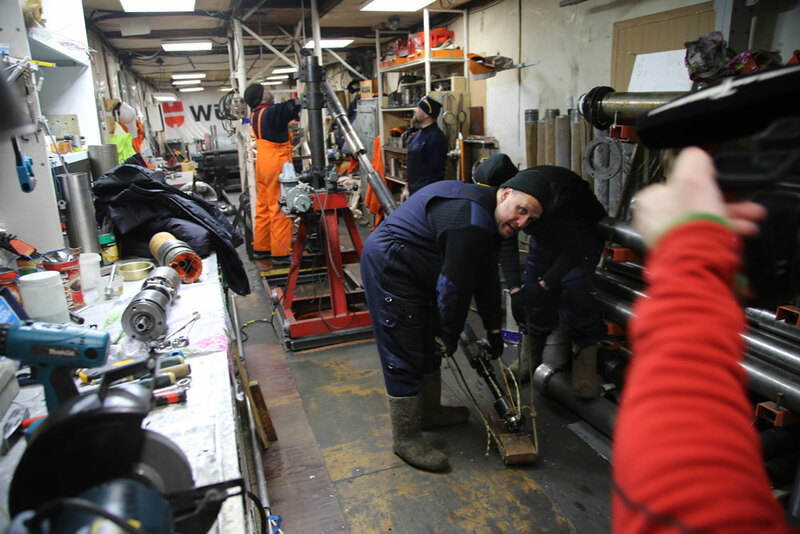 On the 10th of January everything was ready, we waited for the sea vessel in order to supervise ourselves the procedure of loading on the vessel, and, most important, fastening of the vehicles in the hold. The food at the station is so-so, sometimes they go to borrow foodstuffs from the Chinese, as their station is less than a kilometer away. The Chinese station is slightly larger than ours, portraits of the leaders are also hanging on the walls, and the employee who was the guide of our excursion was accompanied by a sharp-eyed young gentleman who did not introduce himself, decidedly their KGB-man. By the way, on the Amundsen-Scott station a smiling American lady who was the guide of our excursion also was accompanied by another smiling American lady, also sharp-eyed. Perhaps it is the difficult times, or perhaps we have something “spy-like” written-drawn on our faces. In my opinion, they are unable to decrypt Russian faces, since in reality only one question was written on our faces: where is the shop to buy some tea at last. 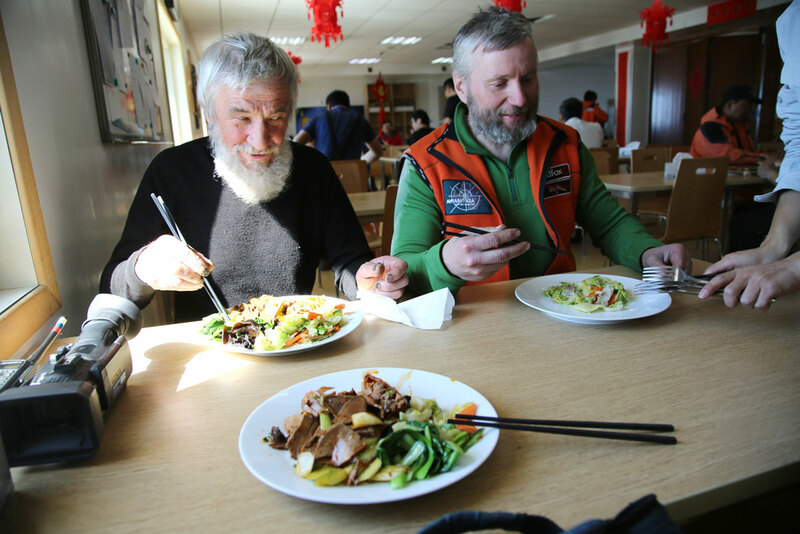 When passing by the Chinese canteen, we could not refrain from making a hint to our convoy that it would be not bad to taste some real, genuine Chinese food. We had the opportunity to taste it, we liked it, even Nikolaich smiled, though recently he has got somewhat rigorous; I have a photo, I managed to capture the cheerful moment. The main task of the Progress station is: to provide habitability of Vostok station. In former times cargoes to Vostok station were towed by Kharkovchanki, “Khokhlushki” in folk language; now they were replaced for Kassbohrer snowcats that have excellent cross-country capability with good traction characteristics. The journey to “Vostok” and back (3000 km) now takes a month instead of 3 months at the time of the "iron marches" on Khokhlushki. However, this new machinery requires more attention with less heroism, while our heroic compatriots really do transform themselves, but not at the highest pace. The snowcats are also very effective in cleaning snow on “Vostok” after winter season; they say, only the flag identifying the nationality of this settlement of the brave people is seen above the snow. About one third of the fuel towed from “Progress” to “Vostok” is consumed by the tractors themselves. The Americans have a higher useful output, their tractors consume a quarter of the towed fuel, but they have a well-tended road, not just a trail, and the average altitude of the route is 700-800 meters less. But let us return to “Progress”. The station includes a library, billiards, fitness equipment, steam bath, SCALES which indicated that all of us have lost weight during the journey, and a tambour - smoking room, in the unbearable stench of which all people entering the main building are immersed for a few seconds; a good training facility for breath-holding. The chief, Voevodin Andrey Vasilievich, is rumored to be an experienced diver, it seems that regular breath-holding helps. 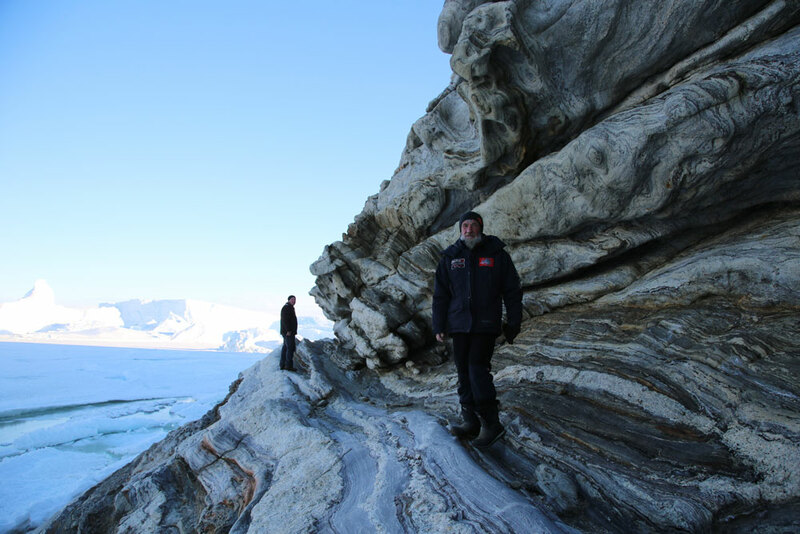 TV on all our stations in Antarctica shows only VGTRK programs, that is, the never-ending "60 minutes", and Solovyov with Kiselyov. Some phylactic power still remains in the folk, there is an internal TV network on the station, and pretty good documentaries are hidden there, so it is possible to move from the first box to the second. 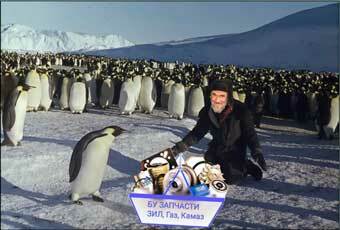 Antarctica is far away, and there is hope that Kiselyovs-Solovyovs will not notice the betrayal through the TELESCREEN. 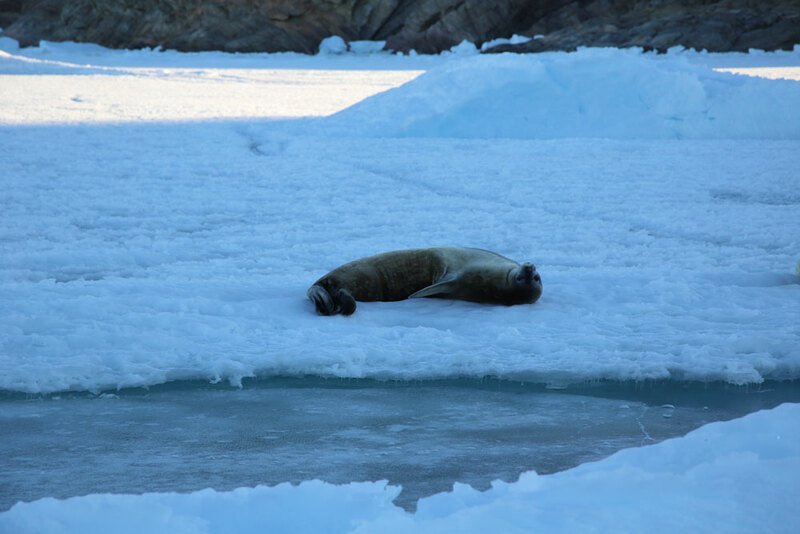 Animals and live plants cannot be kept on Antarctic stations, it is prohibited, except for small vegetable gardens on hydroponics in special premises with leaktight doors and restricted access. We have seen such a vegetable garden on the American station, and a similar one is on “Progress”. That’s how the matters are. Greetings and best wishes to all. V.Ye. January 06, 2019, S69°23’, E76°23’ ODO 5570 km. “Progress” station. t° - 0°C. Almost windless, it’s warm. We arrived here in the evening, not without adventures, but let me describe everything in due order. 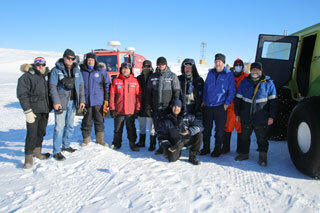 We departed from Vostok station on 01.01.19, about half past six in the evening. All station staff bid us farewell, they tried to give us some food for the journey, despite the fact that they themselves have almost nothing to eat, we were very touched. The folks are absolutely unpretentious, indeed, as it always is in the places where it’s really hard to exist-to survive-to work. At last we got off, and - heading north! Due to regular caravans from “Progress” station, the "marches", as they are called here, the track is seen quite well; I used GPS only to have a look at the speed, the mileage traveled and remaining ahead. Of course, this is not a road, rather a trail, a snow-bound track, but anyway it is much better to drive along it than over unbroken snow; the vehicles move notably easier, sometimes we switch to the IV gear. Fuel consumption dropped drastically, though in some places the altitude increased from 3400 m near Vostok station up to 3900 m. It got colder, but not awfully, to just about -45°. On January 4th, in the morning, the antifreeze in the radiator of the green vehicle turned not into kissel, but into aspic, despite the fact that the manufacturer's (LUKOIL) label promised us carefree life down to -80°C. The red vehicle avoided this cup of woe: it was aligned to the morning sun at a more fortunate angle and, apparently, this was enough to keep this damn liquid in working condition. Two hours were spent in various activities: revving up and warming the radiator by the high-temperature burner with the risk to burn it through. That’s not to speak about the nerves, the waves of nervousness were radiating perceptibly from the red vehicle, they were slightly attenuated only by the aluminum body and the physical law stating that intensity is inversely proportional to the square of distance. At last the radiator became operable-circulating, and we departed. We traveled well, 280-300 km per day, perhaps one day it was even 330 km. As the altitude decreased to 2500 m, fuel consumption dropped to just 20 l/100 km. On the fifth of January, when less than 400 km were left to “Progress” station, the whiteout happened; it was so dense that moving further became impossible. As is usual in Russia, the greatest heroism was demonstrated by the woman; with the words: "on some occasions I had to walk even 80 km", she attempted to save the expedition by walking in front of the vehicles and showing the right way, and the male part of the team with difficulty retained her from this deed, of course, for the reason of preserving own (manly) reputation. We, the machine men, skillfully used the situation to recoup the sleep deficit, because it is well-known: while the captains argue, the steamboat is at a stop. Alas, the whiteout dissipated after three hours, and fate again called us to the steering wheel. And just 50 km before the finish of the historical motor rally "off-road and ...", the bearing on the shank of the main transmission of the intermediate axle on the red vehicle broke into pieces, and, by the way, in this journey it was the first serious failure of the two vehicles on the travel over 5500 km. 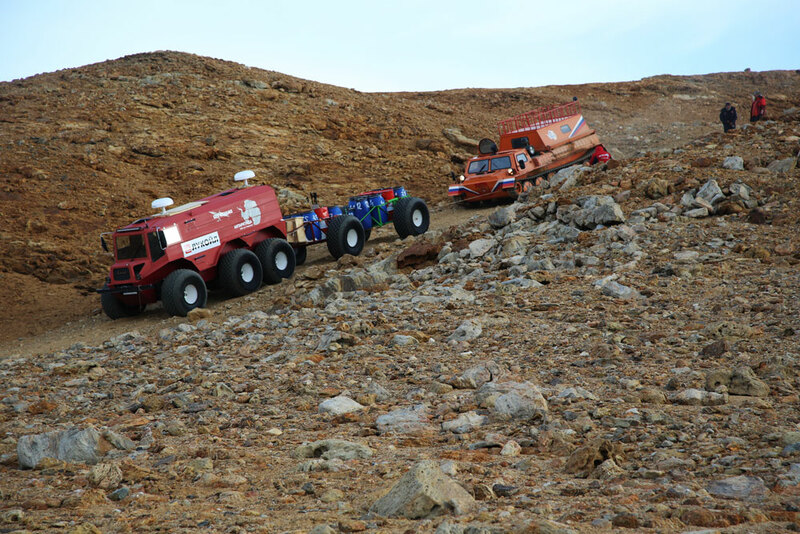 We blocked both rear axles on the red vehicle and decided not to repair it in the field, but to move further on the front-wheel drive alone. While these manipulations were carried out, Pelsh put on the harness, the crampons, tied to a rope, the rope was tied to the vehicle, he took the probing rod and, under the chatter of cameras, led our caravan along the track, probing snow for hidden crevasses. Fortunately, the demonstration of passing hazardous places did not last long, and after 5-7 minutes we again moved to the sea at the usual speed. Andrey Mirakin on a quadricycle met us before the Progress airfield, and we drove after him towards the main adventure of the day. 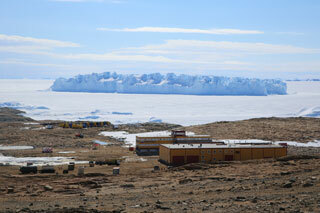 Soon we passed by the airfield, then the snows ended, we entered the oasis. 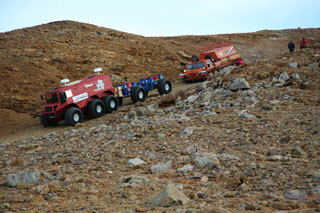 We were separated from the Progress station by two passes, not high, but with steep ascents-descents. We ascended to the first pass, and a breathtaking panorama opened: sea covered with ice and icebergs in it, sparkling in the sun. After a month of contemplating the endless monotony of the white horizon, this view was unexpectedly beautiful and impressed even stronger. After taking a few photos, I began the descent. The descent was steep, but not long, a hundred meters. Having forgotten that just a couple of hours before we unloaded the caravan of the red vehicle as much as possible because it was driven only by the front axle, and put all the load to our caravan, I began the descent in the first gear. But the trailers happened to be too heavy, they started to fold up, then the vehicle veered across the track, but attaboy, it miraculously managed to keep balance, it did not overturn, though I sadly got ready to this event. The trailers folded up like an accordion during transportation, but the hitch devices also did not break. On the whole, all ended well this time. The next two descents-ascents we had backup provided by the Gazushka, that is GTS or Gaz-71 (crawler-transporter-snow and swamp-vehicle), if someone does not know. Curious individuals can get information about it in the Web. This was arranged for the sake of speed, a welcome meeting was arranged for us at the station, so we did not want to compel people wait. That was how, not without silly adventures at the very end, we finished the journey. The reading of the odometer of the GPS receiver showed 5570 km. Just 34 travel days, and no heroism. Truly they say: "there are no extreme situations; there are unprepared people". January 01, 2019, "Vostok" station. Morning. Everybody are asleep. So, the New Year has come. Now - about the events of the previous week in the right order. We departed from the Americans on 24.12.2018. Before our departure they arranged an excursion around the station; as expected, everything is in good order, conditions for work and life are quite decent. In summer there are 140-150 people at the station, in winter - 40°C people. 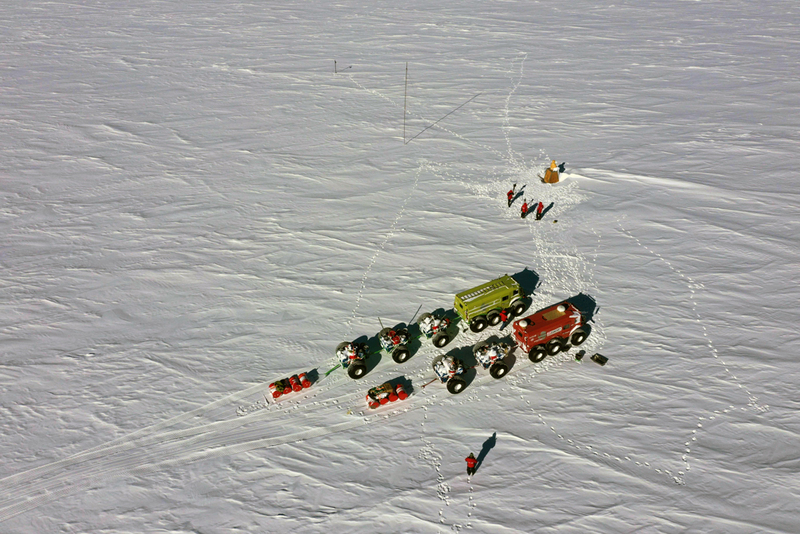 Approximately 75 flights of C-130 Hercules are made from McMurdo to the pole during the season, two sledge-caterpillar caravans with fuel arrive, so things are humming there. 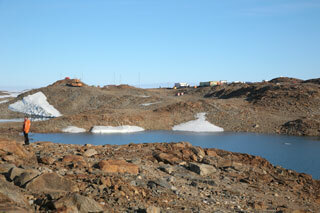 We met several stunningly beautiful Arctic Trucks Toyotas with Taiwanese male and female tourists. They came from Novolazarevskaya. We visited the American tractor operator who brought fuel; no romanticism at all, the house-cabin on the sledge runners contains a washing machine, a coffee machine - in general, nothing interesting. The operator’s salary is 1200 conventional units [USD] per week. 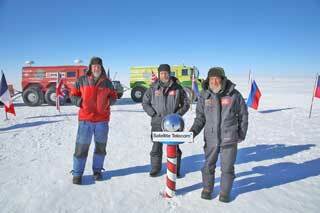 Early in the morning we left the South pole heading North. Funny, but no matter which way you drive, it's all North. The air is such that everyone's throat gets dry, in the morning the nasopharynx is completely overdried. Obikhod treats everybody by giving homeopathic peas every evening. Dr. Kisil supplied him with these drugs for all of us. It helps. Again, the endless driving over boundless expanses. Basically, two types of snow terrain are alternating: either zastrugi, mainly across the track, or flat but loose snow, which is not easy for the vehicles because they get overheated, and from time to time we shift to the second gear in order to give some rest to the engines. At some madding distance from all coasts Obikhod suddenly saw a skua gull. Our first reaction to his scream "bird!!!" was to try to bind him up because he seemed the first to get the roof blown off, but soon we saw that it was a real bird. 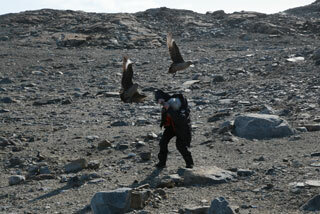 It was the skua gull to get the roof blown off, not Obikhod. 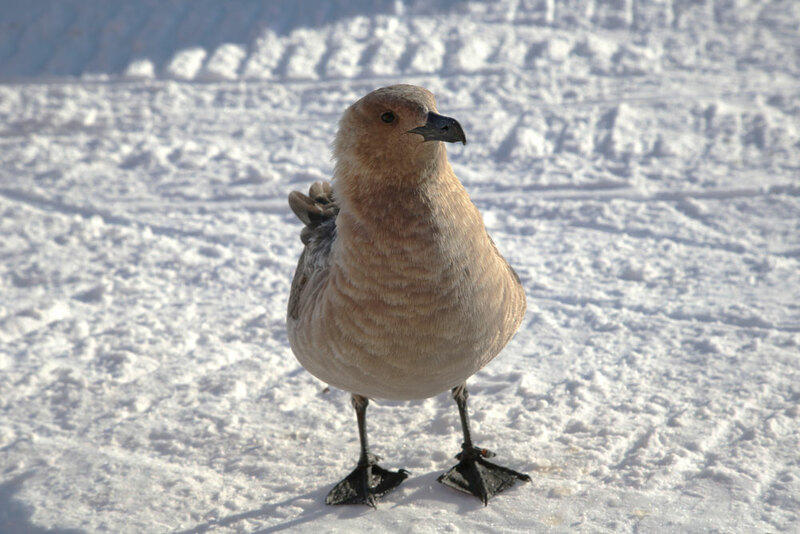 Experienced people say that the birds also may have disorders in the head, not only our kin. We scattered some crumbs for the bird, Obikhod even deprived himself of some salo [bacon]. The bird sat for some time, but did not get any fish from us, and flew away suffering from heartburn caused by salo. The workdays are dragging on again, 4 hours at the steering wheel, refueling, eating, getting in the sleeping bag for two hours, then the cycle repeats. On the 29th of December we arrived to Vostok. The Motherland cannot be confused with anything, the eternal inscription in huge letters "Vostok welcomes you! 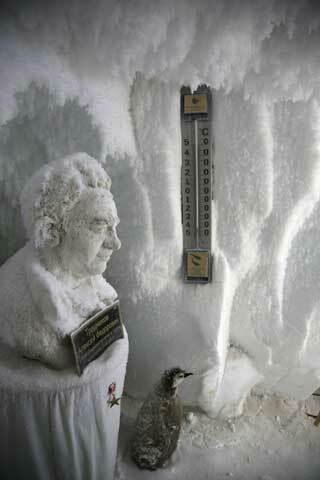 ", personnel of the station, a light drink reception outdoors at -30°C, and we get into the station. The station is buried under snow; to get into the premises, one has to pass about 80 meters in snow tunnel. Struggling with snow is permanent, though the same is true for other inhabitants of the continent, the nature tries to impose its order in its territory. Several famous "Kharkovchankas" (or "Khokhlushkas" in folk language) are parked on the site, huge tracked vehicles weighing 30 tons, they carried cargoes to Vostok from Mirny. Now they were replaced by German snow cats, and the honored grandmothers are parked here, most likely – forever, as the parking is free of charge. The people are hospitable, visitors are infrequent here, and it gives us the feeling of internal freedom, we understand that they are really glad to see us. We had an excursion to the famous drilling rig, we were shown ice cores up to 1.3 million years old. The rig is in remarkably good order, the men are working with interest; however, it is impossible to force anybody to come here without interest and for these salaries. 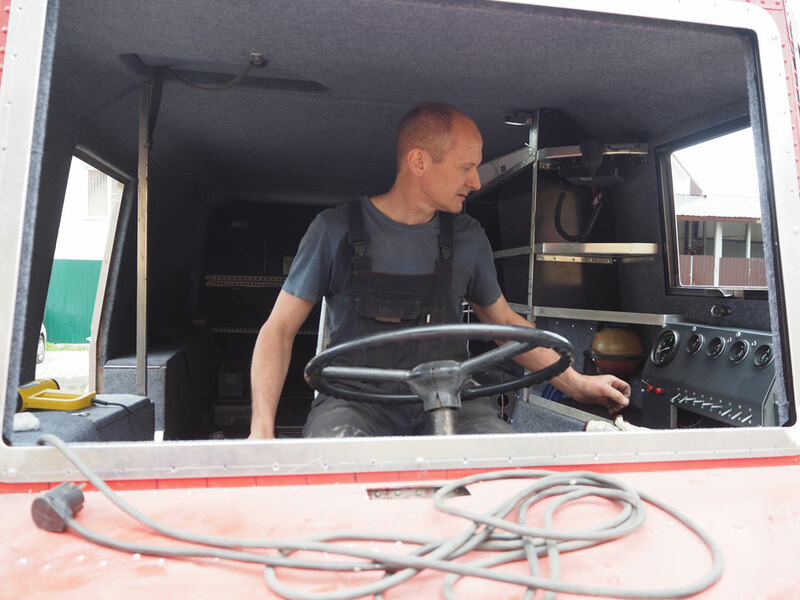 Anton, the diesel operator, who has not been at home for two and a half years already, works for 80 thousand rubles (per month, not per week). 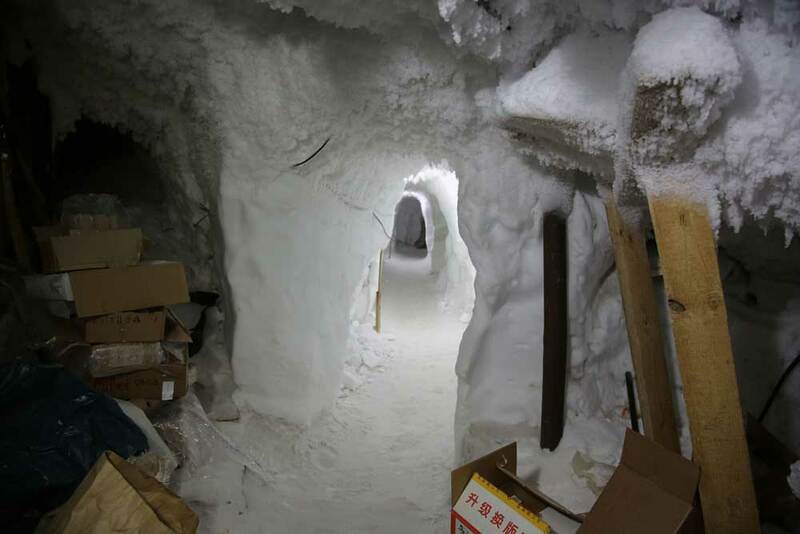 The New Year party passed in due manner, heartily, and in the middle of the night we were taken to Vostok-1 station buried under 5-7 meters of snow. The excursion to climatized premises with constant climate on the New year night. -60° C, naturally, everything more or less suitable for the fitting-out of the "new" station was taken out from the premises, only a giant collection of reel containers with movies remained there forever. People live here with dreams of building a new station, even German engineers came to survey the area. In general, Vostok, like our entire boundless homeland, lives with hope that finally something will shift, and a new life will begin. Impressions and feelings after Vostok station are wonderful, but I see nothing surprising in it, after all, these people were selected by life most scrupulously. Intercommunication with them may be considered a gift of fate. December 23, 2018, South Pole. Expedition reached the South Pole. Odometer 2214 km, 404 km remains to the South pole, or rather to the entry point to the so called "dirty" sector, the zone through which different tourists get to the Pole. Until today the weather was perfect, -25-30°C, practically windless, with bright sun. Today evening it got cloudy, I am afraid that tomorrow whiteout may occur. 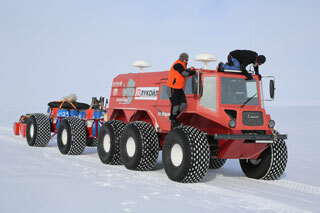 The vehicles now pull better than at the top of the Antarctic dome where the altitude was 3700 m and even higher. Today we descended to 3200 m. Vehicle speed is certainly determined mostly by the type of snow terrain, zastrugi (snow ridges) reduce the speed substantially, it is quite easy to break the suspension by driving too fast over speed bumps, and there are 700-800 of them per each kilometer. 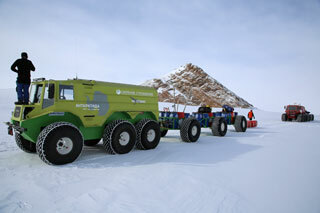 Today we replaced the drive chain of the rear axle on the green vehicle – it was in a completely terrible state due to out-of-limit loads during the first stage of the route, driving to the top of the dome with the trailers full of fuel. It stretched by 20 mm at the length of one meter. Even the German origin did not save it from Russian craftsmen. We can if we want to. We replaced it with a spare American chain, and now we’ll test this one. The snow in some places is very loose. It is not a serious obstacle for the vehicles, but the load on the engines increases significantly; we switch on all the heaters in order to cool the engines, and thus drive across Antarctica in the African heat. Nikolaich even takes off the suspenders of the pants from the shoulders, and in combination with the white beard this makes his silhouette look like a wild mix of a fashionable snowboarder with a half-crazed pensioner that got to who-knows-where for who-knows-what reason. Our route is very monotonous, even the Plateau station and the Pole of Inaccessibility station were so leveled with snow by the winds and on such a vast area that even from afar and in clear weather one cannot see the slightest hillock, though there were buildings up to five meters high. Only Lenin sticks out on his box from under the snow. Well, let him stick out, that’s the most appropriate place for him. Visitors are not very boring there, in 60 years he was visited by only about 70 people or a little more. The first losses began to occur; someone or other opens a barrel, takes what is needed and leaves it open. After a couple of hours of driving someone may, or may not, remember about it, and in the meantime the barrel is full of snow dust, and the lid is gone. That’s routine practice. 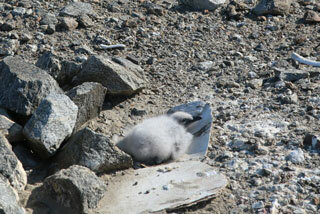 In the Arctic we even carried a couple of spare lids with us, but this time we forgot about it. Now about the main thing: today is the day of the main Saint for people like us, namely Saint Nicholas of Myra, the patron of seamen and travelers. So, today it is quite natural to swig off a glass for those who are on the way. That’s how the matters are. December, 17 2018, Pole of inaccessibility. Today approximately at 3 p.m. the expedition reached the first intended goal - the Pole of inaccessibility. 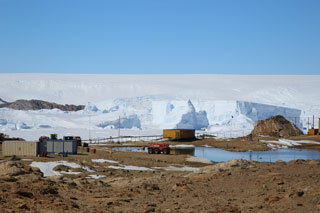 The history of this place in Antarctica was taken from the web-site Remarkable places of the world. 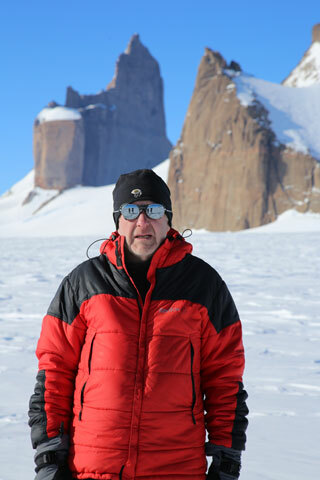 It is not difficult to discover the Pole of inaccessibility on the coldest and whitest continent of the planet. 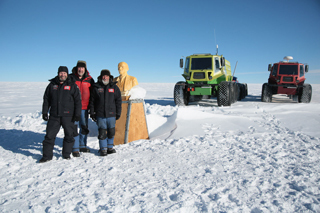 Amidst the endless ice desert of the Antarctic you will meet a monument to Lenin. The bust of Lenin in Antarctica certainly is small and is made of plastic, but still it is the leader’s southernmost monument on Earth. It was mounted here by the 3rd Soviet Antarctic expedition in 1958. 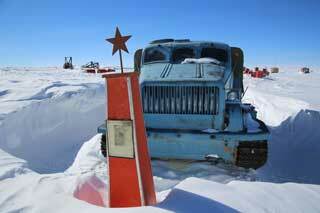 To date, this monument is all that remains here from the scientific station of the USSR epoch. The station facilities have been buried long ago under a thick snow cover, only the bust of Lenin once installed on the roof is still visible. 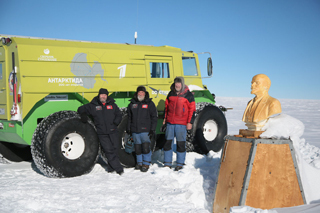 The Soviet researchers arrived at this remote location on December 14, 1958. Reaching the South Pole of inaccessibility was the main goal of that expedition. It is noteworthy that it is much more difficult to get there than to the geographical South pole. 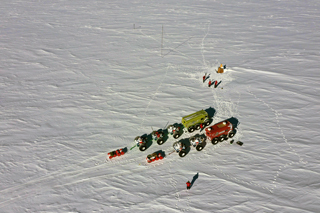 A team of 18 men arrived at the Pole of inaccessibility by a sledge-crawler convoy and constructed a small hut with floor space 24 m² capable of accommodating 4 people. During the construction of the station, a bust of Lenin was installed on its highest point. The station elevation is 3718 meters above sea level. Ice thickness at this location is 2980 meters. Average temperature in the vicinity of the station is -57.2 degrees Celsius. 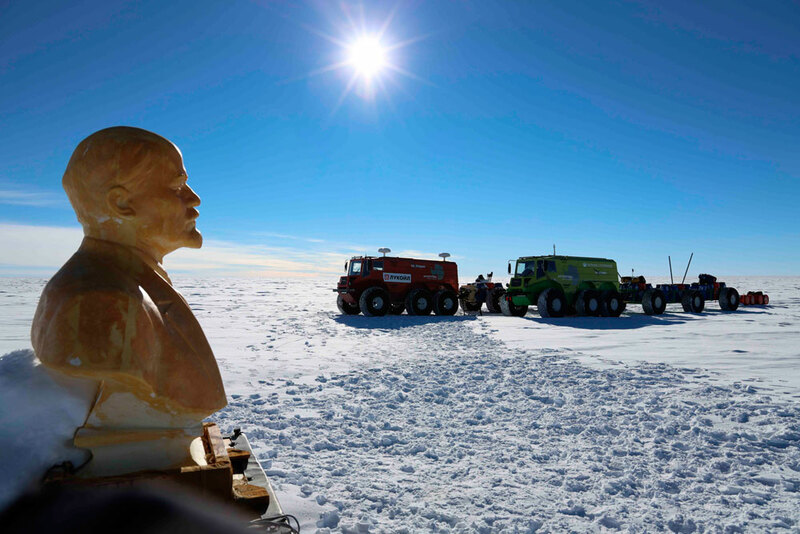 The station buried under snow and the bust of the leader with a memorial plaque dedicated to the conquest of the Pole of inaccessibility by Russian polar explorers have been designated a Historic Site or Monument. 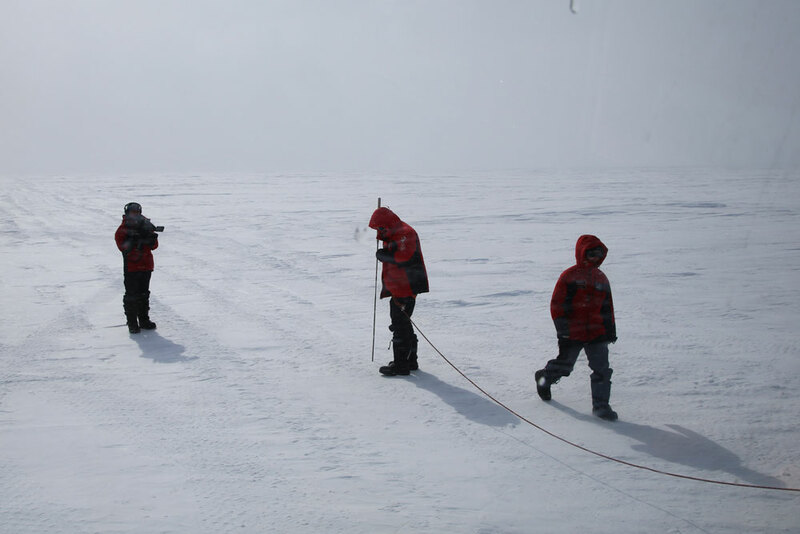 The previous time people visited the Pole of inaccessibility was on December 27, 2011. 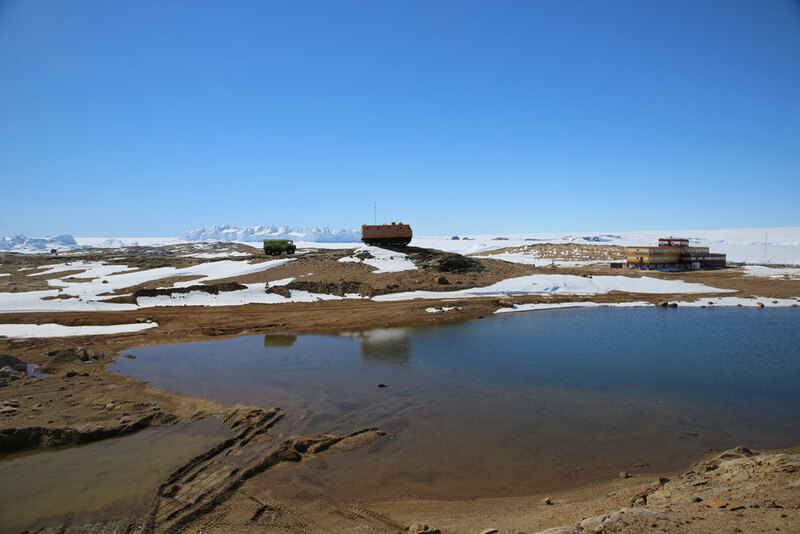 For many days we are driving over the highest part of the Antarctic dome, the altitudes around are about 3500-3700 m, and in addition either the snow is difficult to drive (the so-called snow swamps), or zastrugi (snow ridges) prevent us from switching to the third gear. So, we ride on the second gear from morning till night, the average daily travel is about 150 km. We do not operate the engines above 2500 rpm, otherwise they get overheated, and besides the caravans start swaying while they are still too heavy. Up to now we are still lucky with the weather, it is sunny and windless, though the temperature is permanently about -30°C. The sun is very intense, during the stops the tires get significantly warmer. The maintenance men have a lot of work, at each stop it is necessary to clean immediately the recesses for the outlets of drive shafts from the housings of the vehicles, otherwise the snow gets frozen, and soon after the dust cover tears apart; replacing it takes an hour or an hour and a half. A couple of times we replaced the dust covers, then the conditional reflex was learned well, and now during the stops we do not forget to enjoy the pleasure of lying under the vehicles for 5-10 minutes. That’s how the matters are. Best regards to everybody. We were busy with the trailers adjusting the suspension. Kubasov is struggling with data transmission to the homeland; the struggle goes on with varying success. It seems that Dmitry Zakharov was right, the best place for the antennas is at the vehicle roof. The folks were apprehensive of harmful emission over the head; we phoned to Moscow, and it turned out that SHF emission is not only harmful, but also good for health. Tomorrow we will install all this hardware on the roof of their vehicle. 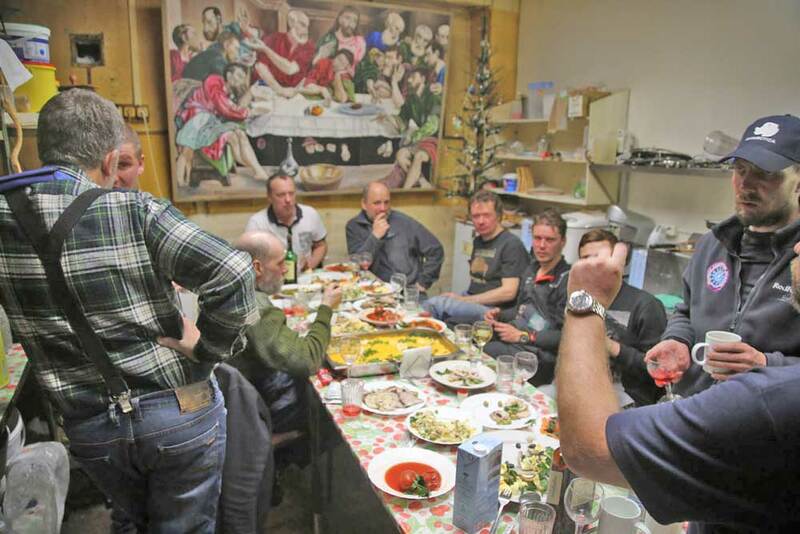 Today during supper we decided to depart the day after tomorrow, on the 4th of December. I hope that we’ll manage to finish with various minor items and arrange the loads in the vehicle in such an order that it will be possible to survive in this horrible mess of belongings, tools and electronics during two months and not get crazy. Sasha Kubasov suggested to fix better all the items in the vehicles, otherwise they would fly around the cabin. We reassured him saying that our travel speed will be equaling that of the gun-carriage with the coffin of the General Secretary of the Communist party. We are in Antarctica! We departed yesterday as scheduled, about 10 o'clock in the morning, and after 6 hours arrived to NOVO ice airfield. 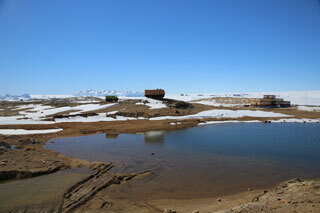 Novolazarevskaya station is located at Schirmacher oasis, 8 kilometers to the North. The places of rock outcrops (except for the mountain peaks) may be called oases, because it is possible to build and settle on such outcrops without the necessity to struggle with the accumulation of snow and thawing and sinking of the structures in the ice. Novolazarevskaya station is located at sea level, the airfield is higher, at about 700 meters. 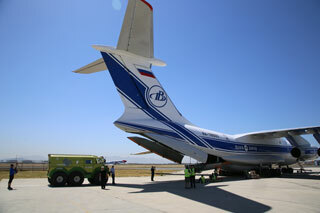 Basler and Twin-Otter aircraft operate on inland flights. Basler is a modified Douglas DC-3 or Li-2, which is practically the same. The thrifty capitalists installed up-to-date engines on these airplanes, and the old-timers fly excellently. Now about our creative and production team: all odds and ends were unloaded, we were provided a large tent-garage for the assembly of ATVs. Though it is sunny outdoors and the frost is very slight, it does not seem very hot due to wind, especially if it is necessary to work barehanded. 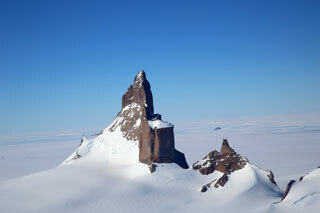 Yesterday I had the opportunity to fly by Otter to the local mountains, to beautiful Ulvetanna peak. There are many vertical walls several hundreds meters high, the scenery is fascinating. 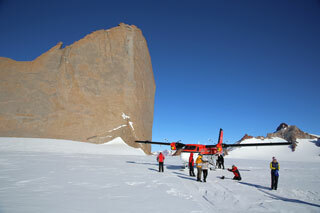 I carefully surveyed the glacier from above looking for crevasses; from the plane they are visible much better. The crevasses are really there, but relatively few and not very wide. We are not intending to relax, but cheered up a little. Regards and best wishes to everybody. Yours V. Yelagin. Well, the vehicles and all our load are in the airplane now. Loading started at 10:30, finished at 13:30. Local people from the warehouse facility are very friendly and professional. The air-crew is great, in a word, the real transport aviation: good and not very good landing strips, all kinds of loads, and often no alternate airfields - in short, it is not like the route Moscow-Munich. The loadmaster only asked, if we prepared the sleeping berths for us inside the ATVs or not: anyway it is better to lie than to sit on tip-up seats along the board. It's pleasant to imagine: you are lying in your ATV which is moving at a speed of 700 km/h. And besides, he advised to wrap more tightly in polyethylene the bunches of green birch twigs for Russian steam bath intended for gifts, so that they do not get overdried; the man is a real expert on the subject. And tomorrow morning we’ll slowly go, half-asleep, to the check-in counter, will get the boarding-cards and will put our carry-on luggage into the x-ray device (God forbid manicure scissors be found with somebody), and we’ll get onboard the aircraft, to the ATVs which are full of the most prohibited hardware. All in all, everywhere the same fiddling. Weather at the destination point: -6 … -10°C, Sun, fresh wind up to 20 knots, so we’ll have to get dressed in the airplane. At the altitude of about 1500 m we should not forget to pull out the plugs in the double-glazed windows in the vehicles to prevent bursting, and before landing to fit them again so that the windows do not collect moisture, because looking through the befogged windshield for two months is bad enough. 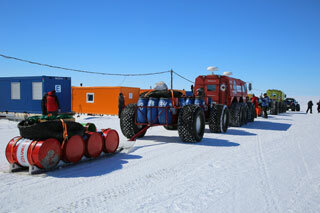 For the assembly of trailers and complete formation of caravans we’ll have 2 days. On the 3rd of December we must start driving. In the evening I’ll drink a glass of wine for the soundness of the ATVs, they will have a hard work. Well, that’s enough for now, the next communication session will be from Novolazarevskaya. Greetings and the best wishes to everyone. Yours V. Yelagin. November 28, 2018, Cape town. It is the third day in Cape town. 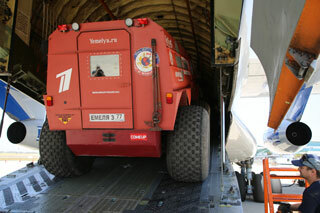 In fact, not in Cape town but rather in the warehouse complex of the local airport, tinkering with the vehicles. The day before yesterday we unloaded them from the containers, all day spent outdoors. The weather is sunny, windy, the right sort for me to get thoroughly burnt. The face became brick-red, everything hurts. That’s a fair punishment, at my age I might be cleverer. Today and yesterday we spent under the roof, without this African sun. The vehicles were covered with advertisements, we are sorting the foodstuffs, for some reason their quantity is twice as much as necessary, tomorrow we’ll reduce it by at least a third. Departure will be on December 1, loading the airplane will be on the previous day. The weather according to the forecast at Novolazarevskaya should be good, -3…-7°C, sunny. The temperature at Vostok station is -38°C, the wind chill index (by perception) is -54°C. Now it is stylish: to intimidate with perception, it really undermines the combat spirit. 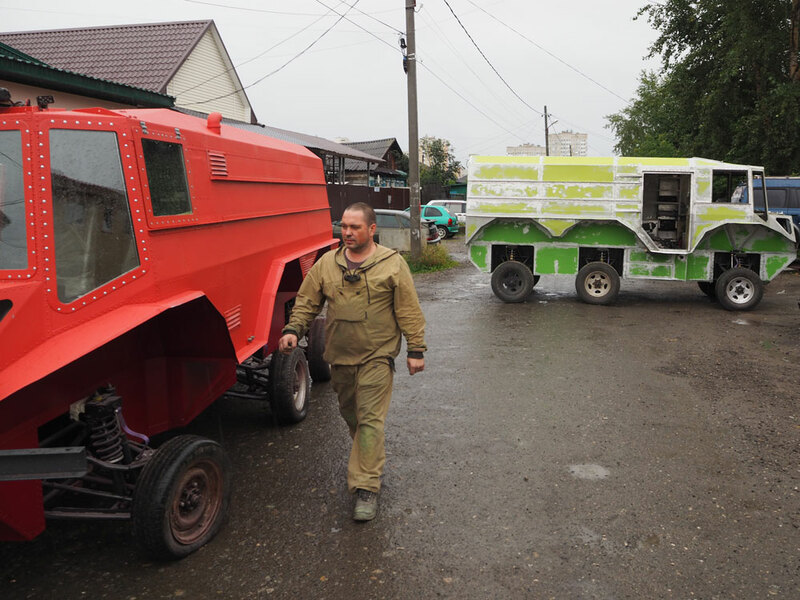 Nikolayich wanted to swim in the ocean, but the chief did not permit due to selfish fears to lose the mechanic specialist and to get a pensioner on a sick leave instead. Certainly at night it is possible to rush off to the water, he is a resolute man, so I’ll try my best not to be fast asleep in order to stop him if needed. Crevasses, radars, etc. are still on the agenda. The opinions expressed by experienced inhabitants of high latitudes are very different, we listen to them enchanted, and the more we listen, the less we understand what to do. Probably the problem should be solved by multiple methods: a radar is installed on a rod on the vehicle, and Nikolayich on a rope with a spear is walking in front of the radar. So it would be more reliable. At the breakfast we saw Christian Haas from the Wegener Institute, we met him in 2013 in Resolute after the travel from Russia to Canada. The world is not only round, but small as well. There were also Liuda Korobeshko with her husband Alexander Viktorovich Abramov, they will fly with us by the same flight to Novolazarevskaya, want to see something. I envy their energy, to fly for one day to Antarctica from Moscow, it's nothing to sneeze at! That’s how the matters are. Best wishes to everybody. Yours V. Yelagin. November 25, 2018, 6:30 a.m. Dubai Airport. The ice broke up, members of the jury! After a sleepless night in the huge A380, I am trying to formulate the first impressions of being abroad. What am I absorbed by? The same as usual on the first day of any expedition: feverish attempts to remember what I have forgotten to take, as it is still possible to phone to Moscow and to instruct Makarov what he should take with him, thank God that he will depart to the airport from our apartment. It's very wise to arrange so that someone from the team departs a little later than the others. And here we have a sunny morning, +25 deg. 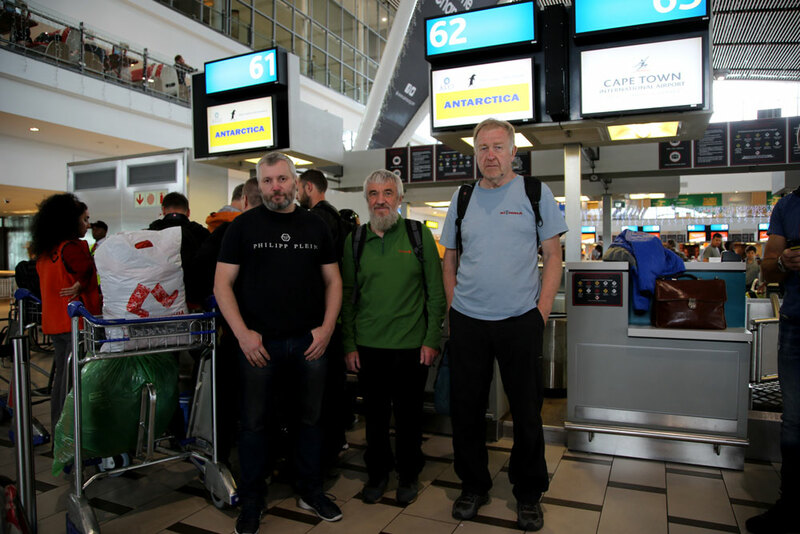 C outdoors, a cup of coffee for 500 rubles, three and a half hours of wait – and again on board airplane heading to the brigandish city of Cape town. 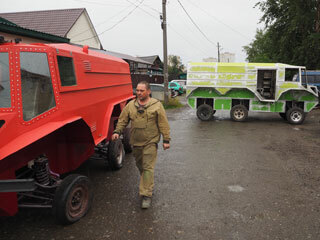 Nikolaich firmly declared that he will immediately go for search of the tavern “Black Cat”, while the girls, that is, the ATVs, freight, etc., can wait. I think it is a correct decision, because, minding our age, we cannot postpone such things until tomorrow – another occasion might never happen. He said he will go without a bulletproof vest, he was a fatalist at all times. The vehicles have already arrived to Cape town, so we'll have to get to work at once. Representatives of the shipping company wanted to unload the containers without us, asked if the ignition keys are in the locks; we replied that the cabins are locked and the keys are with us. I was pleased that someone thinks so well about us and about the vehicles. Normal people cannot imagine that the cabin doors are not lockable in principle, there are no ignition keys, just a button labeled START. This time the hazard passed by. In Moscow I was rejoicing that from Dubai to Cape town I’ll fly sitting by the window, that from above I’ll watch Africa, Zambezi, and so on. With each written line of this post I understand: there is no hope, I’ll pass out after the first fifteen minutes of flight; so not only I am left without winter this year, but I will miss watching Zambezi and Tanganyika as well. That is how joylessly our journey starts. Only a mountaineering omen reassures: bad weather on the approach to the climb always leaves hope for good weather on the route. That’s how the matters are. Regards to everybody. Yours V. Yelagin. The vehicles are transported by a steam vessel, a week ago they were loaded into two 40’ containers with the trailers and all gear. The containers are of increased height, the vehicles on plywood wheels were driven inside easily. The vehicles may be placed into a container of standard height as well, but in this case for passing the door opening three or four gentlemen (preferably corpulent ones) should be put in the stern, so that the suspension experienced the firm male hand, to say the least. The truck drivers are real heroes, iron men; moving across the spaces of our vast Motherland at such speed is nothing to sneeze at. 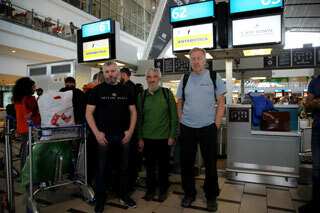 From Ekaterinburg to St. Petersburg in two days – and they look fit as a fiddle, both helped us to load the containers. Many thanks to you, Alexey and Leonid! As I have already mentioned, once again the stage of creativity is left behind; the stage lying ahead is no less creative, but now in respect of caution, not to press the accelerator pedal too much, to force oneself to leave the waggon for a refreshing wind, to look around and not to hurry. Time is coming to torture the ATVs by exorbitant and off-design loads, we have to pass between Scylla and Charybdis not breaking the machinery and manage to reach, without any outside support, perhaps at shuffling, but still proud pace, the destination point, which is just 6000 km away. In 2013 we overcame 4000 km from the shore of Severnaya Zemlya to the Canadian village Rezolute, while this time the distance is half as large. The main obstacles for the vehicles are: altitude up to 4000 m and very firm zastrugi (erosion ridges), and for us – finding carefully the passages in the zones of crevasses. It is very interesting, how the sledges will behave, each of them will carry 900 liters of fuel in addition to our traditional caravans. I tried to interrogate the veterans of Antarctica on this issue, but without any definite result, the opinions have divided. Some say – the wheels (trailers) are better, others say – sledges are better, while the majority reckons that nothing will help us, that this is not the Arctic with its “greenhouse” conditions and terrain, and everything will fall to pieces, no matter what we do. Never mind, such forecasts invigorate and prevent from relaxing. Ahead of us are adventures and a somewhat silly year without winter. It’s autumn now in Moscow, while we get on the airplane, and after 10-12 hours of flight arrive to the spring Cape town, further on – still more, we fly to the South and get into the beginning of summer; on the way back we shall disembark in Moscow shortly before spring. Probably an extra summer in one’s life is a good thing, but what about the missing winter? At night I arrived to E-burg, brought the shaft from Dubna. Mikhail Valentinovich Ivankov, as usually, helped us; this ATV creator, inventor and simply a concerned and interesting gentleman, is patronizing our project for almost 10 years already. He has access to a production site where Victor, a young man, managed to manufacture the sophisticated item quickly and with very high quality. 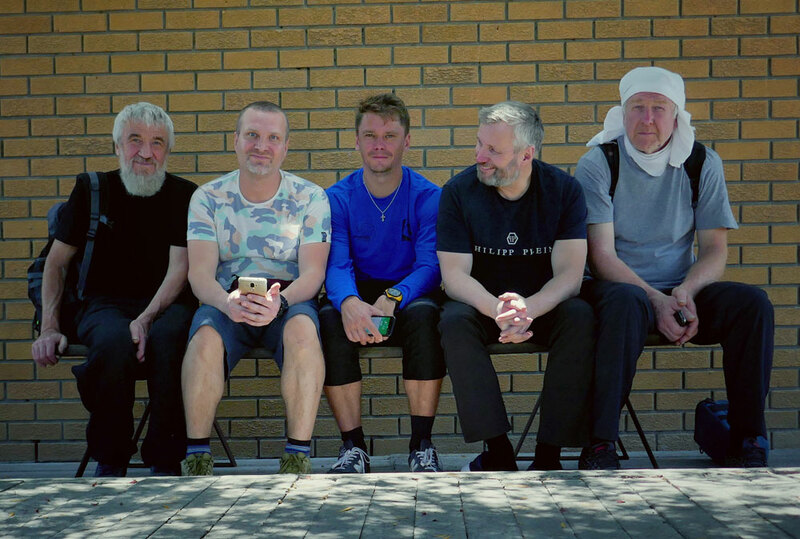 I’ve slept no more than 3-4 hours and spent the whole day on the go with the vehicles together with Kostya and Sasha, nevertheless I feel fresh and not tired – that's because what I do brings pleasure, all the more so working with good-natured people. Like in the previous expeditions, sadness is dragging at the heart-strings; one more interesting stage is coming to the end, technical and creative stage, and with good opportunities. Cape town and Antarctica are ahead; all the time I am thinking about potential troubles, because according to the well-known law of life, a trouble will happen even if it could not happen at all. Tomorrow we will load the ATVs on the trucks and will drive to Petrograd, to the terrible excise customs and Baltic customs. But this will be at the weekend, three more days of hustle and bustle, and then finally we may relax and start work with the maps, consultations with specialists, search for some more additional information, etc. 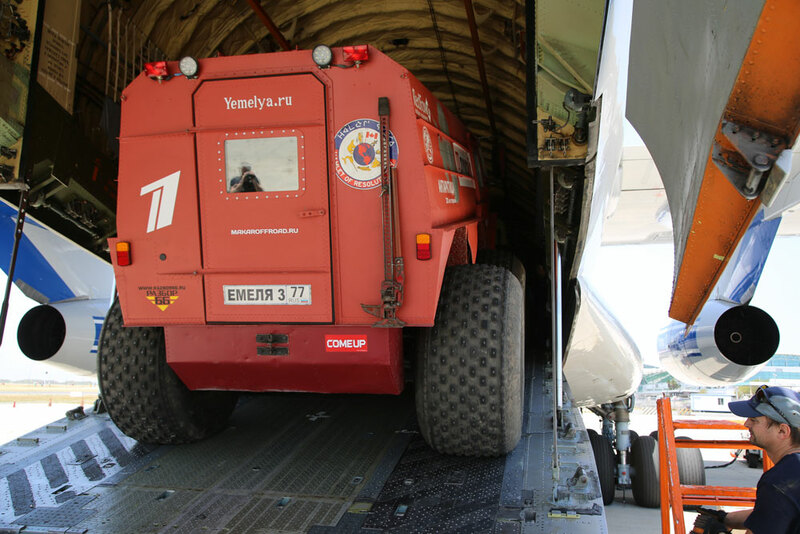 We have no news about the equipment, they don't consider it necessary to inform us on the degree of its readiness, while Friday is the deadline for sending freight by container, later on – just put it into a bag and go with it to the airplane. I would rather have all this behind: Moscow, customs, experts-erudites with their teachings about what we should put on, how to wear it, etc. 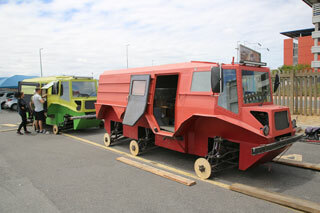 Preparation of caravans for the journey is almost completed. We mounted the proud license plates of the 77th region on the vehicles and continue gathering endless small items. Suddenly, today – oh joy – an order comes from the customs: we have to photograph all merchandise (it turns out that we have "merchandise"! ), describe the materials they are made of, and their purpose; briefly, without any fanaticism, just a couple of pages for each item, not more. Everything has been already packed in foamed plastic and wrapped by scotch tape. We clench our teeth, take the knife in hand and go straight ahead - unpack everything, photograph, and pack again. If we don't pack the goods, the customs officer will be upset: it's so pleasant to force these guys (that is, us) to unpack all over again for a scrutinizing inspection and organoleptic study. Therefore – we are packing all. As a consolation, the customs broker said: penny ante, think how it is to describe a few 40-feet containers and a couple thousand items, so don’t worry, be happy. I started with the sledgehammer: the photo, detailed description of the material and methods of application. The atmosphere of solidarity of the team is supporting. We are posting the photos of men on the web site with much more pleasure than the photo of the sledgehammer, though it might be also very useful, if it were not for the English-type restraint which is inherent to Nikolaitch and me. That’s how the matters are. Yours V. Yelagin. September 23, 2018, Moscow, Ekaterinburg. Yesterday a request came from Valdis Pelsh office: "Vasily Igorevich, we need the sizes of your (Obikhod and Makarov) feet in centimeters, in order to buy felt boots." I forwarded the request to Ekaterinburg. Makarov’s reply related to the sizes of the feet of technical staff came quickly. I quote ad verbum, preserving the spelling and punctuation of the author: "Felt boots! That’s cool. For me – of white color, if possible. I hardly caught Nikolayich, he is riding around our kishlak on Yemelya, horrifying all the hens here. Size of his left foot is 25,2, right foot – 25,3. My left foot is 26,7, right foot – 26,5. That is in centimeters. More accurate measurements were impossible, the appropriate appliances are not available. I have personal quilted jacket and a hat with earflaps, if that is necessary. I also have quilted pants left from my grandfather, but it would be better to buy something newer (to show off), otherwise I’ll feel somehow awkward with the Americans, they surely have brand new clothes. Many thanks from me personally and from Nikolayich for care." So, our staff has a sense of humor, what gives a vague hope for successful outcome of the undertaking. Indeed, when Thor Heyerdahl has been asked by the competent authorities: what qualities the Soviet member of his expedition should possess (Yuri Senkevich became this member), he replied: "Sense of humor." Yesterday we twisted the intermediate axle drive shaft during the test drive. The reason: negligent assembling. The mournful evening passed in grievous thoughts - where the shaft (it was unique) can be made, with guarantee of high quality. The concilium resolved: nowhere, especially in such a tight (one or two week) time frame, and to be made soundly. Today in the morning I anxiously waited till 11 a.m., phoned to Ulm, to Hans Rammensee, the great restorer of old-time autos and our good friend. He is a serious man, he took timeout for one hour to investigate the issue. The photo of the part has been forwarded. After an hour, the long-awaited call: "Old chap, here is a private workshop round the corner from my place, a small one, but well-equipped, the craftsman is a proper guy, I know him well enough, he will do it. Heat treatment? Surely, we're all grown-ups." So, the Bavarian village is ready to help in the holy cause of celebrating the 200th anniversary of the discovery of Antarctica by RUSSIAN sailors under the command of Bellingshausen and Lazarev. Maybe the surname of Faddey Faddeyevich (Fabian Gottlieb Thaddeus von Bellingshausen) helped. So, I hope all is well, the shortcomings are eliminated, organizational conclusions are made, the vehicle will be even better than before. And meanwhile, at our side of reality: the customs has strictly warned that the replaced parts must be returned to the homeland in full compliance with the temporary export list, as a proof that Nikolaitch and I have not opened the retail sale of used parts for cars made in mid-90ies on the coast of the Antarctic continent, thus driving the penguins in a state of utter amazement. Most likely, this is done due to love for the animal world of the Southern continent. Because mass death of penguins caused by laughter shall not be permitted in any case. So, we have good people everywhere, preserving wild life, and not only detecting smuggled goods and suppressing it mercilessly. Thus, everything and everybody is under control - people and even penguins. On Friday Nikolaitch and I must fly to Moscow, there is a plenty of things to be done there: to buy various technical small items, to collect personal belongings that are scattered all over at different homes, summer cottages and villages, in order to forward them by sea, and not to roam with them through the airports. It is not so simple to hire a truck from Yekaterinburg to the cradle of the revolution (i.e. the coup of the 17th year), to the sea port, because everyone wants to head only to Moscow. The customs broker is eager to see the documents for the ATVs, and I have none, and nowhere to take from. They are pure DIY items, thank God that they are not forbidden. I recall that when we crossed the Bering Strait from Alaska to Homeland, in the village named in honor of Schmidt (the gentleman who managed to drown the icebreaker, for which deed he became a national hero), two police captains, well-fed to the utter indecency, approached us and asked: "May we see the documents on the vehicles? ", and in reply I told them confidentially that the vehicles were stolen in Alaska, and now are driven to the place of sale. Similarly, at the customs we’ll have to explain to the officers that in real life the items without documents still do occur, even though it is very bad, and it is necessary to contend with this vicious phenomenon until complete eradication. In whole, the process at customs is expected to be creative, I would say - exciting. In the meantime, we install the masts for transmitting terminals on the trailers, in the evenings the painting of trailers takes place; the paint is so poisonous and smelly that the exhaust ventilation in the room is not enough, and no one except the painter can withstand it. The weight of the caravans is growing every day, it is enough to make you weep. Every minute we recollect: we have forgotten this, and it is necessary to take that... In the evening (after 23 hours) I watch different videos on YouTube, how Toyota vehicles daringly travel through the vastness of the Southern continent, while talking about the terrible sastrugi (erosion ridges) and loose snow. For some reason they all use aviation kerosene mixed with motor oil as fuel; why it is better than good diesel fuel – I cannot understand yet. Let's wait and see. Today the movie-people (so we called cameramen in the Himalayan expedition to mt. Kanchenjunga) arranged their basins, Open Port satellite terminals, transferred something to someone and departed home, satisfied. Meanwhile we, with maniacal eagerness, continue searching for flaws in the vehicles, fix them, in this way suppressing the acute phase of an attack for some time, but this period is short, some other flaw is found again, and the cycle repeats. The days fly by, the outcome is approaching, the customs demands from us detailed lists of the contents of our boxes and barrels, and very explicit lists indeed: phrases like "hand tools set" are categorically disapproved, that means that the customs may not "give the go-ahead", so we write, write... It is highly desirable that every item were of "previously used" category, but when in a conversation with the customs broker I stuttered that we would prefer not to take "previously used" spare parts, he became very sad and explained that spare parts pertain to a very special registration procedure, and far from a simple one. In short, once again it is the "Saga of the Customs". It's more difficult to drive out than to get to the destination point. In order to fall asleep easier and sleep better, Nikolaitch and I passed to tea made of fireweed, but despite of that the sleep is nervous. I hope that the White Silence will heal the bad nerves, especially if nobody will be snoring nearby. But I guess that is too much of dreaming. Local guys practicing witchcraft over our ATVs are mere life-savers, without them we could not manage to prepare the caravans. Some of them are so much imbued by the problem that they also sleep badly at night. They often work seven days a week from 8 to 8 hours, and sometimes till midnight. The lads are real experts: it is the team of "Makarov’s ATVs" company, they need no long explanations – after a brief discussion, how and what to do, they begin to work without a word. They put some ginger into it, the work is accompanied by loud pop music, thus forcing Nikolaitch and me to get accustomed to endure the hardships and asperities sturdily. I must report that the repertoire repeated daily, combined with knocking of hammers, screech of hand grinders, cracking of arc welding may, perhaps, raise endurance in us, if we still remain alive until completion of the work. I am somewhat hard-of-hearing, and it saves me. That's how the matters are here. Yours V. Yelagin. September 13, 2018, Ekaterinburg, no wind, no drift. Today three members of the expedition joined us - film Director Ms. Kristina Oganesovna Kozlova and cameramen Denis and Alexander. Yesterday Eugene arrived, the specialist on adjustment and installation of TV transmitting complex using which the narrator will tell the workpeople in winter Russia how life goes on in summer Antarctica. These are the last days before dispatching the vehicles to St. Petersburg - everything is strained, all sorts of trifle things are emerging now and then, and the head is permanently stuck with this muck, it is impossible to focus on serious problems: for example, to think about how beautiful, according to rumors, Moscow has become, so faraway, seeming almost dreamlike from here, from Uralmash plant. 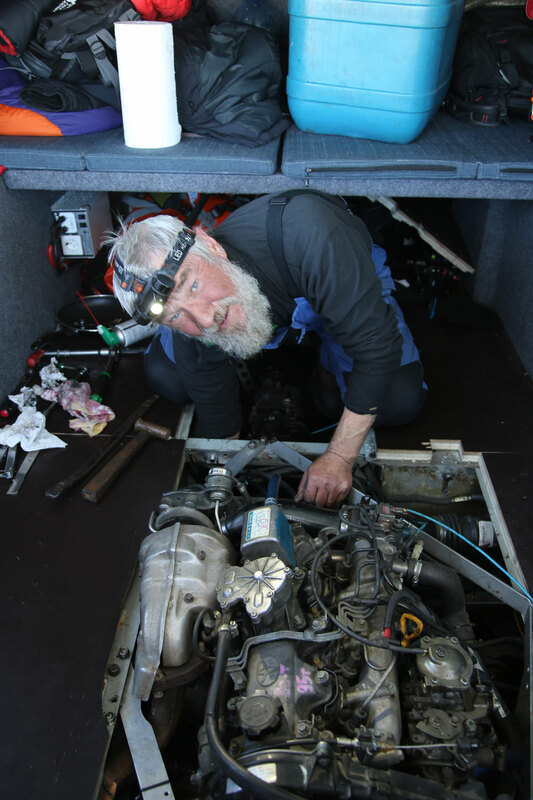 Endless lists of spare parts, tools – the toilet problem alone could offset the brain, because everything, absolutely everything eaten by us in course of two months, we will be obliged to transport out of the boundaries of the Southern continent. I still hope that at least we’ll not be forced to move all this stuff to the Motherland, plenty of it is there already, we could gladly share our traditional technologies with anybody. But speaking seriously, we endeavor an autonomous travel over 6000 km long, and experienced people again regard it as lunacy, thus awaking our engineering excitement and ambition to prepare the machinery so that we are able to overcome this distance successfully, avoiding falling in a crevasse and without quarreling. I am intending to write diary this time as well, and to post it on our website. 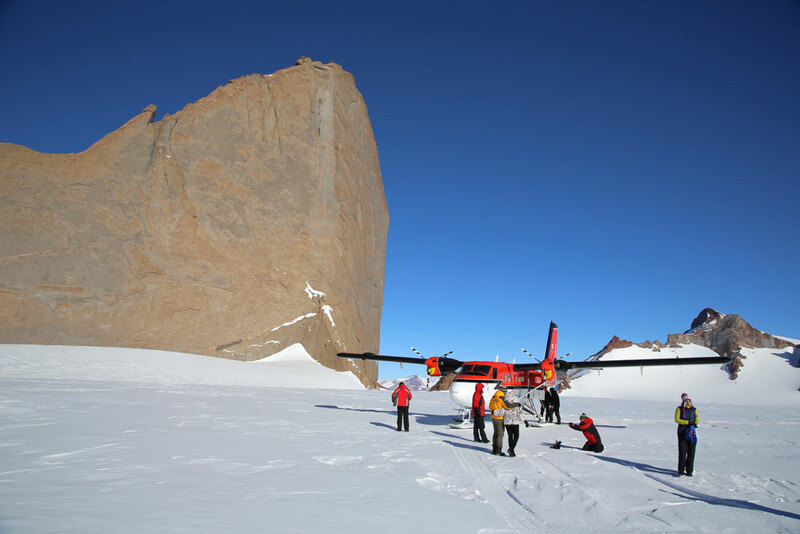 One of our main concerns known today - the problem of crevasses; they are not numerous, but they do happen, and even a single hospitable crevasse may be enough to stop suddenly the series of reports. There are no satellite images available; a ground penetrating radar or sonar requires not only a qualified operator on board, but also slows down the movement significantly. 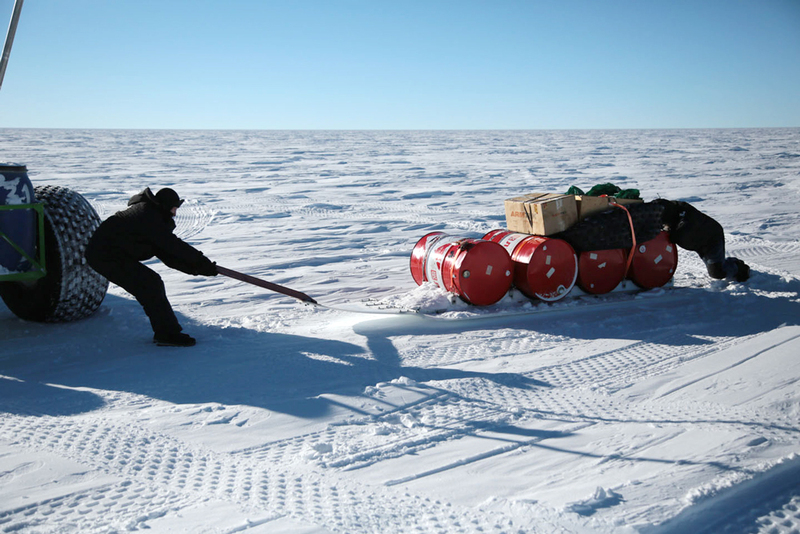 Those who travel to the South Pole from Novolazarevskaya station are using the well-known route, which was passed several times. However, our route from Novo (a landing runway near Novolazarevskaya) to the Pole of Relative Inaccessibility lies far from of the “beaten” routes, it has been passed just once about 60 years ago, and at that GPS-less era it was not possible to put the route on the map accurately.